In the driving seat with Mio and Tom Tom. Despite driving for for nearly 10 years and being a total gadget girl, it might come as some surprise to you that I’ve never owned a GPS Satellite Navigation System. I’ve always thought there’s something reassuring about paper maps and the fact that it can be quite fun to be navigated around the middle of nowhere by your partner or friend! We were luck enough to be able to compare two of the more affordable sat nav’s from Tom Tom and Mio… Let the battle begin! First up was the underdog, the Mio S500. Looks wise, I’ve got to be honest, it’s nothing special. A standard black and silver plastic casing with a matt finish touchscreen. Obviously the more attractive a product is the better, but at the end of the day, I don’t feel that it’s such an important feature when it comes to this type of gadget and so it hasn’t affected the overall score by much. The touchscreen is responsive and had a good visibility in all conditions. The Mio is a breeze to set up and works straight out of the box. It has an attractive menu and is very easy to use.I didn’t have many issues at all with the Mio S500, my only comment would be to take care when reaching roundabouts as the route isn’t always clear and a couple of times I took the wrong exit. It’s probably best to just listen to the Mio when approaching roundabouts rather than checking the screen. Other than that, it worked really well – Speed cameras, speed limits, timings and all other stats were bang on and worked with no issues. The routes seemed logical and I navigated with no problems, other than the roundabouts that I mentioned above. Unfortunately I didn’t have the live traffic application enabled on the device, so cannot comment on how good this is. If the rest of the device is anything to go by, I’m sure it works well. Overall, the Mio impressed way beyond my initial thoughts. It really does hammer home the ‘don’t judge a book by it’s cover’! This device has certainly converted me when it comes to the decision between a good old paper map or a GPS Satellite Navigation System Now I’d just love to try out the live traffic function. I would give the Mio an impressive 4.5 out of 5. I absolutely loved it and I don’t want to be without one now! Check out their website for full features and Specifications. I have to hand it to Tom Tom for the general looks of this sat nav – It’s very pretty! I was sent a stylish red unit, however the covers are interchangable and you can pick and choose to suit your mood. Again, the screen was a matt finish and had good visibility in all conditions. When switched on, the Tom Tom as with the Mio loads an attractive and easily navigated menu screen. However, the touchscreen isn’t as responsive or as accurate as the Mio and took a few attempts before I was able to successfully enter the address details. Unfortunately, the negatives didn’t stop there! As with the Mio, the Tom Tom Start2 had the same issue with roundabouts, not only was the route around roundabouts confusing, there were times it wouldn’t tell you which exit to take until you were already ont he roundabout, not very handy if it was the first exit. Once you’ve gone the wrong way though, the recalculation of the route is incredibly slow and on a couple of occasions, I had to pull over and sort it out. And it didn’t stop at roundabouts either, some roads were not clearly marked and last minute ‘keep left’ messages when on dual carriages meant we missed turn offs, adding even more time to our journey. These problems in total added an extra 30 minutes on to our, already, 3 hour drive – not a good start! Things got worse! Not only were the speed limits wrong in some areas, the camera limits as a result were wrong! In one place the Tom Tom was showing me a speed limit of 40mph in a 30mph area! Luckily I noticed this before passing through the 30mph speed camera at 40mph! Also, something else to take note of, whilst on the motorway, all cameras were showing to be 50mph, even though the limit was also clearly showing as 70mph – Confusing to say the least! The final straw came when we were entering London. Despite living off the A3 and there being an option to go that take this road, the Tom Tom decided it wanted to take me into Central London before going back out again. At this point, knowing full well where I was, my patience snapped and I turned it off. A pretty unpleasant experience, which was totally unexpected considering the reputation Tom Tom have. Maybe I had a faulty system? I really hope so for their sake as the issues I experienced could have resulted in pretty awful situations such as speeding tickets. Although the Tom Tom wasn’t too bad on the motorway, with it’s speed and camera accuracy issues, it certainly isn’t something I’d use around town. Overall I’d award the Tom Tom 2/5. For full specifications, please click here. I have to say, this was a total shock result! From the moment I unboxed the Tom Tom Start2, I expected it to beat the Mio hands down. Both retail at the £120 mark. 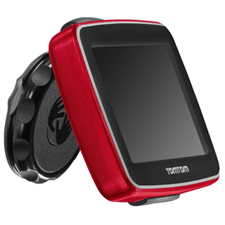 If there was a way of combining the appearance of the Tom Tom with the functionality of the Mio, I’d get one in a flash! 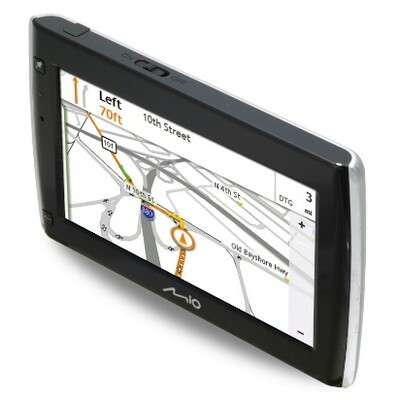 Who knows, maybe Mio might read this review and give me the pretty, slim, functional sat nav of my dreams! A girl can but hope!